That's right! Three years ago I decided I needed to do something more creative, more me, so I typed those first words "Saperlipopette!" and Kickcan & Conkers went live. What a fun journey it has been! Another 2,800+ posts and K&C is still going strong. Of course, blogging has changed a lot in that short space of time, and I have spread my wings... You will also find 'me' chatting, curating and sharing on twitter, facebook, tumblr, flickr and pinterest (which I love! ), in addition to running an online shop. I would like to say thank you for reading, commenting, sponsoring and supporting me. Un grand merci ! Blogging has changed my life in many ways (Repetitive Strain Injury might be one of them! ), and I have met many wonderful, inspiring people both online and off. Jess Quinn, doll-maker extraordinaire, was one of the first really original, outstanding artists I wrote about. I have followed her progress ever since and try to promote her work whenever I can. She is incredibly talented and hard-working, I'm sure you'll all agree. Jess has very kindly offered one of her new Molly Dolly dolls to celebrate these first three years and I think Honey Bee makes a perfect thank you present from K&C. 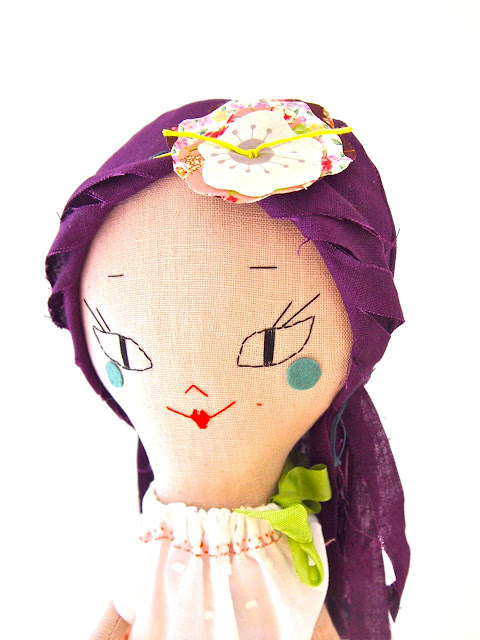 If you would like a chance to win this charming, purple-haired young lady, standing 20" tall and dressed in vintage cotton clothes, please leave me a comment below. The usual drill applies, anyone who relays the information via twitter, Facebook, pinterest, etc will get two names in the hat, providing they let me know! This three-year thank-you giveaway ends on Monday 9th July, 6pm CET. Hello, been following you on Pinterest for a while now - didn't realise you blogged, and what a lovely blog it is too! congratulations on three years. I've recently been following you on Pinterest and love the blog! Your blog is a grand inspiration. I will post a link to your give away on my blogg. Congratulations! 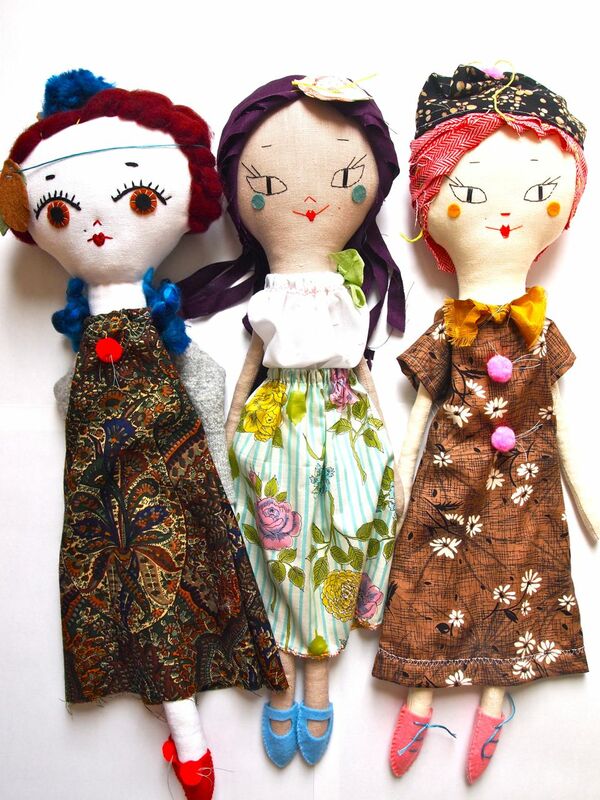 Your dolls are lovely! i love your blog and always check whats new.....and my kids are all grown up! I have been following your pins for a while now - love the way you see the world. Your blog is darling... I live vicariously through you as it has been a profound dream of mine to live in the south of France since I was a child and learned of my family's heritage. I am an artist and seamstress with two little girls and am inspired almost daily by the items you collect/share/sell... Here's to three years! I just love the name of your blog, it gives a promise of originality, fun and a lot of "douceur dans ce monde de brut". And know that I met the person behind, I am an even more dedicated reader ! And I happily shared on Petites Inspirations ! Congratulations on such a success story. Shared on Facebook! Thank you (annalockwood@yahoo.com.au). Happy 3rd birthday to your ever inspiring blog.....to many many more posts! Congratulations Deborah on your blog'a'versary! Here's to many more, cheers! p.s. very interesting what you have to say about blogging having changed - I totally agree. Just RTd you as well. Congrats on your three year anniversary! This is my first time visiting your blog by way of Jess Quinn's shop. I found her shop a few months back and have been in absolute awe of her work ever since :) I'm so excited to see your blog....can't wait to dig in! I just noticed you have a link to my brothers blog as well (50watts)....it's really a small world! j'adore ton blog, Deborah, je trouve que tes inspirations sont les miennes et j'adore cette créatrice à l'imagination infinie! Congrats Deb and sweet happy birthday ! Congratulations. Great achievement. Enjoy your blog very much. Congratulations on three years so inspiring!!! I hope to be many more. Thanks for making us each day a little more beautiful. Congratulations on your 3 years of blogging! I have been following for a little while now, and am always pleased to see the Kickcan & Conkers notification in my mailbox. I wish you many many many more years of sharing art, crafts and your life with your readers. Happy 3rd blog'irthday to you! Congrats, Deborah ! Your wonderful blog is an everyday inspiration for me and many people. Thank you! Congratulations! I have loved following you on pinterest and will now pop over here more often. Will repin on pinterest too! I'm really happy to have found your blog thanks to this lovely giveaway! Congratulations！Deborah-san! Thank you for your findings and imaginations! Congrats! A beautiful treasury of things and imagination. Happy Big Number 3! Keep up the beautiful work we love it. From Holland many congratulations! 3 July was my Birthday, 3 is my lucky number and I love these dolls. Hope so to win this doll, I can promote Jess Quinn in Holland. Wow what dedication! Love the blog and shop Deborah. I will be sharing this post on Facebook! Happy 3rd year, keep going strong you're a wonderful daily fix and it's all sooo fantastic. Happy Days Deborah you're a star. Pretty, pretty..... Love everything you do! I Pinned it on Coats and Clark, Handmade Charlotte,Plaid, and Facebooking it! What a lovely giveaway! My 2 year old daughter would love this doll, (if I let her play it!). Congrats on the blog! I love K&C, love Jess' dolls, and my girl Lucinda would love this doll! Thank you for being with us and bringing SO MUCH inspiration. I love your blog from the first moment I discovered it. Happy anniversary! Congrats on 3 Deborah! Kickcan & Conkers FOREVER!!!! Woow wat super leuk.Ik zal heel er gaag mee willen doen.Je Popetjes zijn zo schattig een lief.